The Group is aware of the extensive nature of our network of suppliers and that there exists risk of deforestation if monitoring and control mechanisms are not in place. Deforestation contributes to loss of biodiversity through destruction of forest habitats, climate change through loss of carbon stores, and irreplaceable ecosystem, cultural and economic functions. As an RSPO member, we are committed to protect all species of conservation concern and biodiversity, in compliance with RSPO’s P&C 7.12, the IUCN Red List and national red list. As an RSPO member, we are committed to controlling any illegal or inappropriate hunting of all species across all our operation areas, including no hunting of endangered, rare or threatened species, other than hunting by local communities for subsistence purpose that does not cause a decline of local species populations. Apical is conscious of our role in the palm oil supply chain and shall act responsibly and proactively to ensure that the palm oil we process and trade is sustainably sourced. We do not knowingly source from suppliers, traders or mills associated with deforestation of protected areas or supplying products that do not meet legal requirements or are non-compliant to our policies. Full details of the Apical Sustainability Policy can be found here and applies to all Apical’s operations, including subsidiaries, refineries and plants owned, managed or invested in, regardless of stake and all third-party suppliers from whom we purchase from or have a trading relationship. We assess all our suppliers annually using The Forest Trust’s Mill Prioritisation Process (MPP) and we conduct spatial analysis on risk of deforestation and encroachment. Our analyses are done using these applications – Google Earth, ArcGIS software & Global Forest Watch. We also carry out ground verifications to supplier mills and estates through Priority Supplier Engagement Program (PSEP). 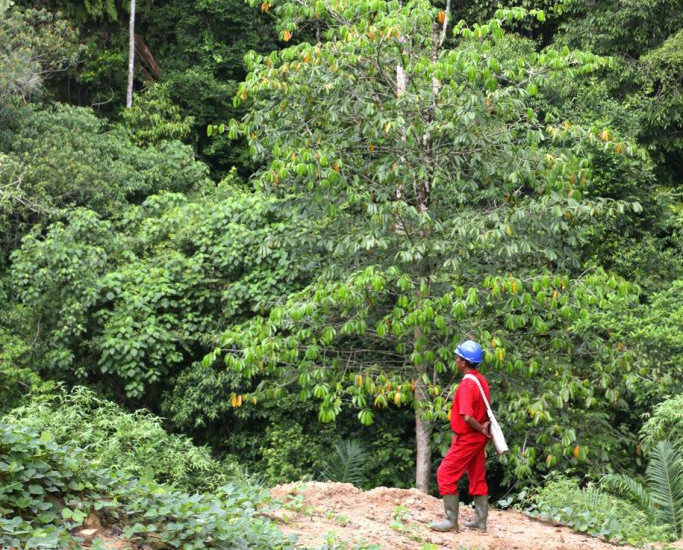 Apical Group proactively engages our suppliers to ensure they adopt similar commitments on no deforestation in their businesses. During our field visits, we enquire about our suppliers’ future plans for new developments and advise them to conduct relevant assessments on HCV and HCS areas before proceeding with any land clearance. Our Management practice is to provide training and recommendations for the mills that source from estates located near HCV and primary forests or other protected areas such as peatlands. We incorporate HVC and HCS training in our Shared Value Programme (SVP) workshops and Priority Supplier Engagement Programme (PSEP) visits, conducted at mills that have been prioritised through our Mill Prioritistion Programme, which is an assessment conducted on all new mills that enter our supply chain to evaluate their potential risks. Our goal is to ensure the long-term protection of forests and other important areas by building an integrated forest management plan that integrates the recommendations of HCS, HCV, Special Environmental Impact Assessment (SEIA) and peatland assessments within larger landscape planning. Apical Group is in Phase 1 of implementing Sustainability Assurance & Innovation Alliance (SUSTAIN), which is an initiative that brings together multiple stakeholders to collaboratively drive innovation in addressing landscape-level sustainability issues across the palm oil supply chain. The purpose of SUSTAIN is to improve sustainability assurance through collaboration with stakeholders by using technological innovations to collect data, and monitor, verify and communicate supply chain risk and progress of NDPE policy compliance to ensure bio-diversity conservation. This platform will assist and incentivize all supply chain members to implement practices that are compliant to NDPE commitments including biodiversity conservation where feasible. It will allow for the integration of supply chain data from existing traceability tools currently being used by its members, such as Jala Setara, RSM, and more. Verification processes will be built into the platform such as automatic detection of volume or yield anomalies and cross-referencing location data with forest cover data available on other platforms such as WRI’s Global Forest Watch and Google Maps. We can address landscape level issues and conservation more effectively through collective effects among members. Once anomalies are detected, a red flag or notification would be raised and data will not be accepted by the system until further checks such as site verifications are made. The design of such verification processes is currently being developed and tested as part of Phase 1. HCS forests hold or have the potential to hold a high amount of carbon and should thus, be protected or restored. Apical Group understands that further research is underway across a number of geographical locations to identify HCS areas that can and should be protected. Meanwhile, Apical’s dedicated Sustainability team is working with our suppliers to adopt a credible HCS identification system. Through our Priority Supplier Engagement Programme (PSEP) visits, our team assists priority suppliers identify, manage and monitor significant biological, ecological and social or cultural values through the High Carbon Stock Approach and geospatial analysis. The High Carbon Stock Approach is based on field trials and expert and scientific recommendations while taking into account social considerations. We engage constructively with members of the High Carbon Stock Approach Steering Group, which was established to implement best practices and oversee the HCS approach. We encourage our suppliers to utilise the HCS Approach methodology to identify protected areas prior to the establishment of any new plantations, while further robust scientific studies are being conducted. Where applicable, we support conservation efforts on existing biodiversity, riparian zones (areas bordering rivers and other bodies of surface water) and high conservation value (HCV) areas that are important to the social and cultural construct of communities within plantations. This aligns with RSPO Principles & Criteria 5.2 and 7.3. The HCS Approach is a procedure to identify areas of land suitable for plantation development and forest areas that can be protected in the long-term. The HCS Approach is designed to also protect and restore viable areas of natural tropical forests within landscapes undergoing forest conversion for plantations and agriculture, while ensuring the land use rights and livelihoods of local communities are respected and secured. For more details on the HCS Approach, click here. HCV forests have an especially high ecological and/or social value. HCVs are biological, ecological, social or cultural values which are outstandingly significant or critically important at the national, regional or global level. All natural habitats possess inherent conservation values, including the presence of rare or endemic species, provision of ecosystem services, sacred sites, or resources harvested by local residents. Apical works continuously to communicate the importance of HCV areas to our stakeholders and, where necessary, provided training for suppliers that we have identified to have risk of encroaching into HCV areas. Our Management practice is to provide training and recommendations for the mills that source from estates located near HCV and primary forests or other protected areas such as peatlands. This is done through our Priority Supplier Engagement Programme (PSEP) visits, where our Sustainability team also assists priority suppliers identify, manage and monitor significant biological, ecological and social or cultural values through the High Carbon Stock Approach and geospatial analysis. Independent HCV assessments will be peer reviewed by technical members of the HCV Resource Network. In 2017, more than 90 percent of the GHG emissions from our three Indonesian refineries and both our biodiesel plants were from electricity generated through our power plants, electricity drawn from grids and fossil fuel used for starting up boilers. GHG emissions from other sources such as chemical usage and effluent treatment contributed to about 4% to 5% of total GHG emissions. For our bio-oils plant, approximately 90% of GHG emissions were from the use of natural gas and chemicals in the same year. The GHG emissions of our operations are calculated based on the ISCC GHG Emissions 205 methodology. Our GHG emissions comply with ISCC requirements. Apical provides training to targeted suppliers on practical methods to reduce GHG emissions in their operations. We train these suppliers to identify the sources of GHG emissions, conduct GHG calculations for all operations linked to us (based on RSPO Principles & Criteria 5.6 and 7.8), monitor GHG emissions and strive for progressive reductions in areas where it is environmentally and economically feasible. We also discourage them from resorting to the practice of open burning, especially in estates with high percentage of peat. Our suppliers are requested to commit firmly to the Zero-Burning Policy adopted by ASEAN countries in all operations and actively engage in initiatives of fire and haze mitigation.